Normally, snowy conditions with temperatures in the low 30s are not ideal for a solo ride. However, when you get 100 people together, add a challenging and rewarding course and great pre-and-post ride food, this type of weather makes the ride even more fun. The 2018 edition of the Vermont Forest Fondo, organized by Bryan and Carlyle Grundon, took place under such circumstances on Sunday in picturesque Lincoln, VT. Riders arrived dressed in flannels and winter jackets. The Grundon’s warmly welcomed everyone into their home for breakfast sandwiches, coffee, donuts, pancakes, and an assortment of other pre-ride nourishment, along with a swag bundle that appropriately included a warm hat. Despite the chill in the air, the group was filled with smiling faces as it set off at a leisurely pace. 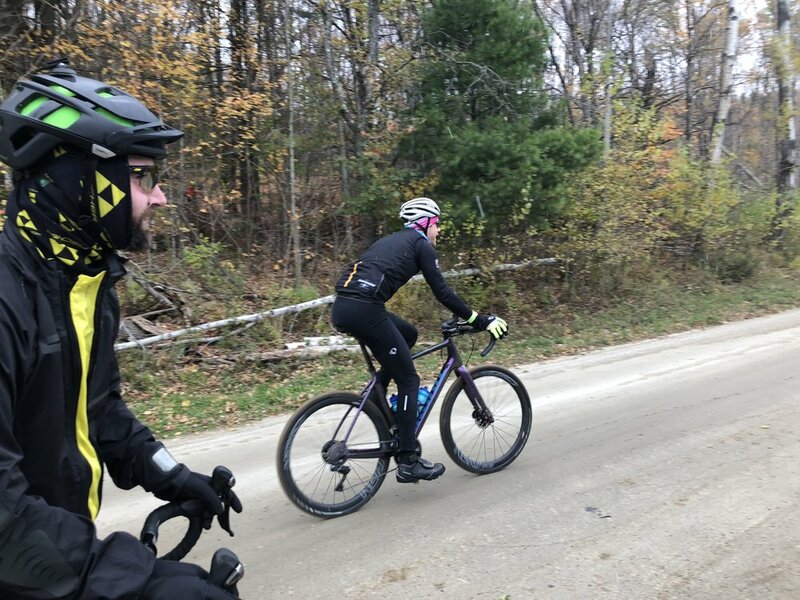 The well-marked course took riders south from Lincoln toward Ripton, before heading east for a short bit and then looping back to Lincoln, covering a total distance of about 42 miles, a quarter of that being on class IV roads or singletrack, with the rest being gravel roads. The Pavé sections kept you on your toes regardless of bike choice, with loose rocks and large mud puddles. However, the toughest segments had been leaf blown, so there was little worry of accidentally hitting a large rock obscured by leaves or washing out your front wheel in a corner. The singletrack section, which came toward the beginning of the ride, swooped and flowed and was especially enjoyable for those of us who chose to ride mountain bikes. The climbs were just long enough to leave people grateful for the numerous long, gradual gravel descents and the two feed stations at miles fifteen and thirty. The feed stations, stocked with water, Untapped products, energy bars, highly-sought-after oatmeal raisin cookies and sandwiches with bacon, peanut butter, fluff, and blueberries in them, were AMAZING. Some people warmed up with rum and hot cider at the second station, but I was just happy to have a cookie and Untapped Coffee Waffle to keep me going for the last hour. By the finish, the gradual softening of the legs that had taken place over the 5,200 feet of climbing and 3-5 hours of riding meant people had relieved smiles on their faces as they rolled down the last short stretch of pavement to a well-deserved hot drink and mouthwatering meal. Vermont Forest Fondo has set a new standard for post-ride meals among the other gravel rides in Vermont. They treated us to a full Korean-style barbecue. A base of seasoned sweet potato noodles and marinated ribs accompanied by a myriad of different additions, including kimchi, fried rice, tofu, and scallion pancakes. In short, there was something for everyone, and each new taste I experienced kept me wanting to continue coming back for more to try each of the side dishes. Afterward, we all demolished several plates of homemade brownies and gingerbread. Those of drinking age washed it all down with beer from Hired Hand Brewing and cocktails made by Bryan, while others chose to enjoy hot cocoa and hot cider. People congregated around the food for several hours and enjoyed each other’s company. The Korean food was a delicious new experience for me, and it has left me feeling sad that all of my future post-ride meals are going to pale in comparison. Vermont Forest Fondo has figured out the key to making a great event. For most people, the vibe before and after the ride, with good food, drinks, and new friends, is as important—if not more important—than the ride itself. There is nothing better than coming back from a chilly, hard day in the saddle and being able to warm up, eat and talk for hours with other people who love to ride. As people slowly drifted home in the late afternoon, the consensus was that this snowy edition of Vermont Forest Fondo was challenging, fun, and TASTY. I'm sure it will be on all of our calendars next for year. Chris is a PG student at Killington Mountain School eagerly awaiting the jump to the professional ranks of cycling. He plans to train in the south of Spain this winter for 2019 prep. You can follow his adventures on Instagram and Strava. For more news, routes, inspiration and culture, subscribe to our email list!